One of the best things about meeting inventors where they work is getting to see their spaces of inventions. How do companies design their buildings to encourage employees to be creative and inventive? The Massachusetts Institute of Technology (MIT) was designed with an “Infinite Corridor”—a hallway that runs through the main buildings of MIT—whose design encourages workers to bump into each other on their way from one place to another and share ideas. Keeping this in mind, I took special note of building design on a recent visit to Trek Bicycle’s headquarters in Waterloo, WI. 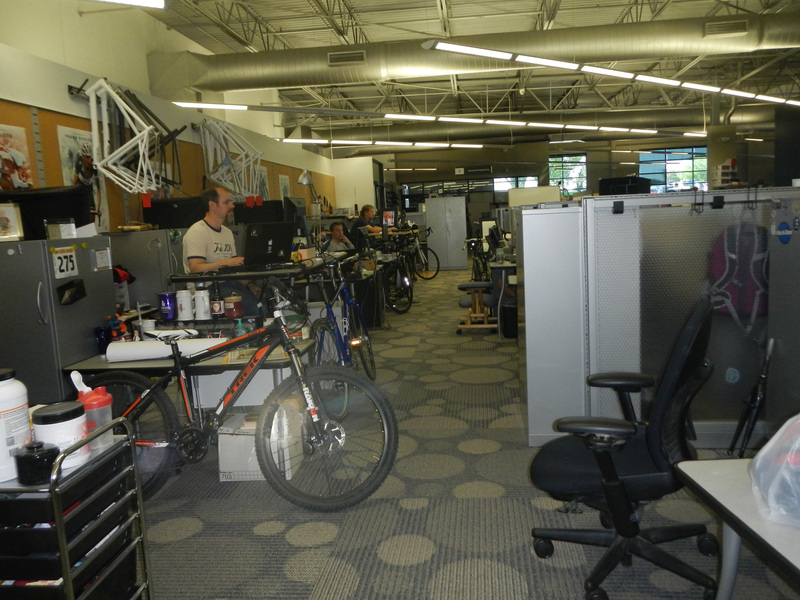 Trek has created a bicycle-filled environment where employees always have bicycles on their minds and within sight. It begins even before arriving at work. Trek highly encourages its employees to commute by bicycle—a definite motivational challenge once the snow begins to fly. They also have an exercise room on site so that employees can continue to bike even when it does snow. Trek emphasizes green energy, so it seems natural that the building uses on natural materials such as wood, natural lighting, and earth tone colors to create a comforting space and to help their workers think along ecological lines. 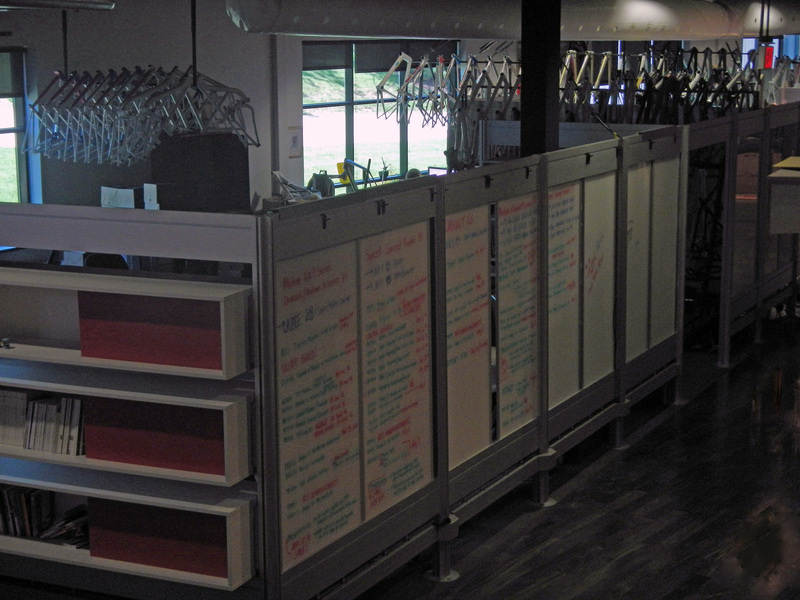 A cubical-style layout facilitates conversation among employees. If you think that this type of layout would have no room for bikes, think again. Almost every cubicle has its occupant’s bike parked outside of it. Not only are bikes typically parked outside them, but the work spaces also have bike components hanging above them. The building also offers many cork and white boards in public spaces for employees to quickly share their thoughts and ideas—and for others to read and be inspired by them. 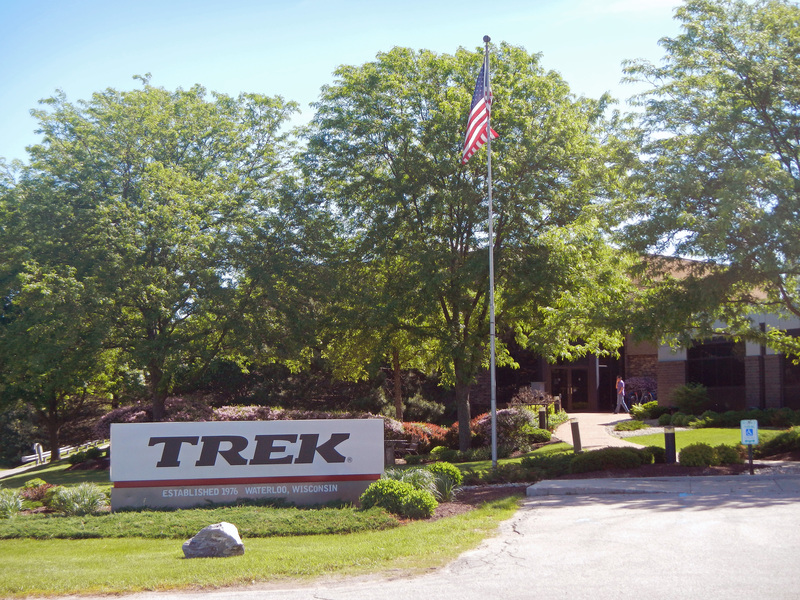 Trek’s headquarters contains a manufacturing section that allows designers to rapidly prototype ideas and concepts. Manufacturing on-site also allows them to wheel newly completed models next door to their photography studio. Housing their marketing and PR team alongside everyone else allows for and in-depth understanding of the products they market. Also, being located on the limits of a small town gives Trek employees the advantage of easily wheeling out new bikes for a test ride. Trek has created a space to inspire bicycle innovation—literally surrounding employees with bicycles, from the individual components to the final, complete form. Trek was the first company to incorporate carbon fiber into their bike frames and is also the first bicycle company to explore recycling carbon fiber bike frames. In our latest podcast, Jim Colegrove, senior composites manufacturing engineer at Trek, describes the evolution of carbon fiber frames at Trek and discusses how Trek inventors work together to create a better ride.